While it is important for dental health workers to be informed on the updated safety regulations and procedures within the industry, they have to also focus on a variety of other issues that are evident in the workplace, all stated at https://www.delaneyparkdental.com for both doctors and patients. It is therefore with great pleasure that Pro-Visual Publishing is releasing this year’s edition of the Dental Professionals Guide to Safety & Hygiene. A topic featured on the Guide includes the safe transportation of instruments and equipment to another facility. Dentists have to ensure that no matter where the procedure is being held (e.g. private nursing home or hospital), it is their responsibility to handle it all in a safe manner. It is (unfortunately) unavoidable when a sneeze or cough is approaching, so there is no excuse to not use the correct etiquette when this does occur. This especially applies for dental health workers as they are constantly hovering over patients when performing procedures. The Guide outlines the numerous ways to prevent respiratory secretions into the air. Washing hands is applicable to everyone in the workplace; for example before work, travelling on public transport, after visiting the bathroom, etc. Dental health workers have to always be mindful that if forgetting to wash hands between patients, the risk of infections is high. This information is further explored under the topic of personal hygiene and personal protective equipment. 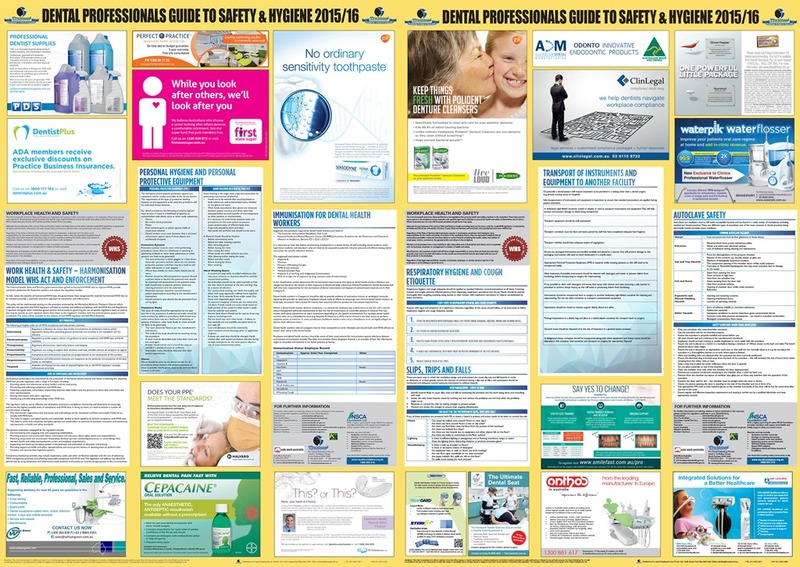 “I would like to thank all of the sponsors of the Dental Professionals Guide to Safety & Hygiene 2015/16. Their support has made it possible for the guide to be distributed free of charge” – John Hutchings, CEO, Pro-Visual Publishing.